On the day before Christmas Eve, Casimir, Isidor, Felix and Ferdinand Mellop all get the same brilliant idea: to surprise the family with a beautiful Christmas tree. Left with four trees, the brothers must find new homes for them, which turns out not to be so straight-forward. 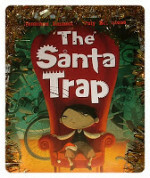 But the brothers are a resourceful bunch and soon they are spreading a little but of Christmas cheer through the town. 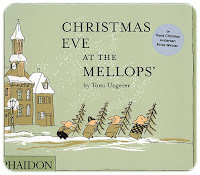 Christmas Eve at the Mellops’ was first published in 1960 and Phaidon has produced a beautiful reprint here. I am always surprised how little Tomi Ungerer is published in the UK. His book The Three Robbers certainly is hailed as a classic in France and yet is little if barely known here. 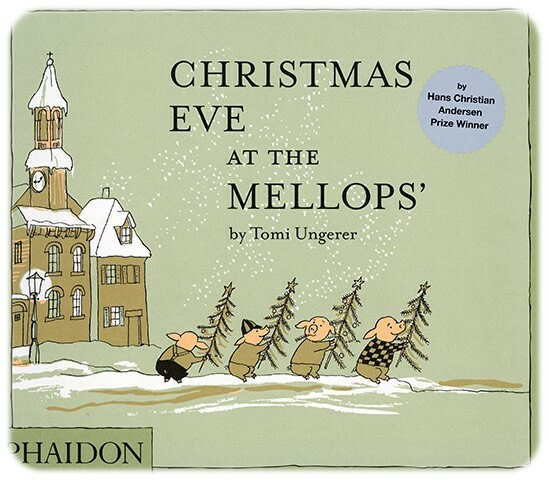 Christmas Eve at the Mellops’ is not typical in Ungerer’s style as we know and appreciate it, nonetheless it has a timeless charm, with little colour used and clean, simple illustrations. 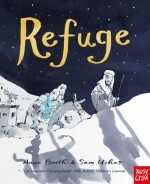 Yes, it might look a little old-fashioned and dated to some, with a character smoking for example, but the spirit that it conveys is very much topical, and maybe even more so to remind us about what Christmas should mean: spending and enjoying time with family, but also not forgetting others who might not be so fortunate. The Mellop boys get one present each, which is very much of the time of course, but yet worls well to remind children that one should be happy with just that. But Christmas Eve at the Mellops’ is enjoyable also and firstly because it has plenty of atmosphere and is fun.